Our son's birthday is coming up next month but we celebrated this weekend because he will be headed back overseas very soon where works as a pilot!! He has been a plane fan from the very beginning - he knew all their names and numbers!! 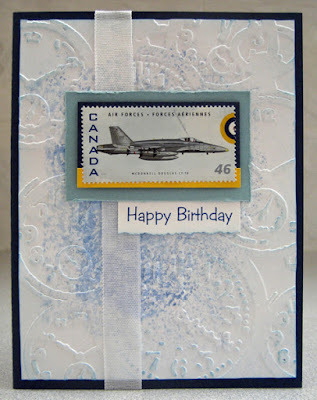 This used postage stamp features an F-18 Hornet which is the fighter jet the Canadian Military flies!! A well known sight and sound of his youth so I thought it would be appropriate for his significant birthday card!! I mounted the used postage stamp onto cardstock - navy and yellow - combined to reflect the colours in the stamp. I used 3D foam tape to mount this element to a warm blue rectangle of cardstock which I had distressed on all its edges. I trimmed the bottom edge of the laser printed greeting with Deckle decorative scissors, sponged the bottom edge with coordinating ink and mounted it to the back side of my focal element with double sided tape. I used a background I had in my stash from when I was creating these fun washi tape cards and embossed it with a timepiece embossing folder. 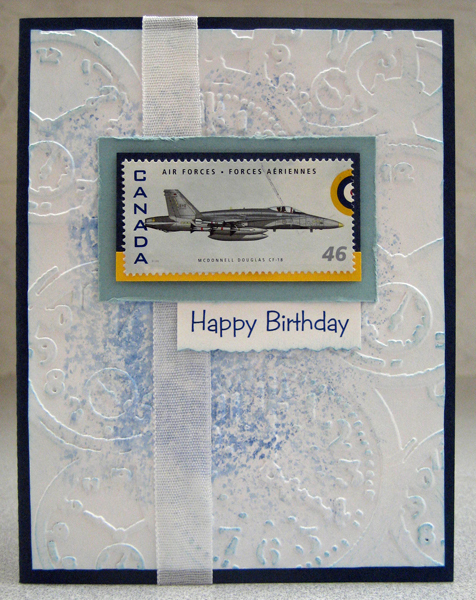 I sponged the edges with the same ink I used on the greeting and mounted it to a navy card front. 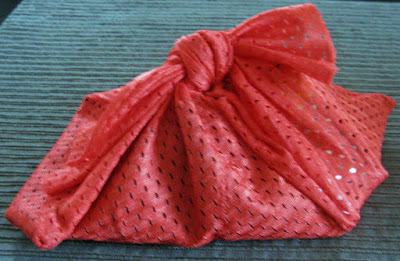 I added a length of white seam binding before adhering my focal element to my card front overlapping it. The ends of the seam binding were adhered to the inside front of the card using double sided tape and are covered by the insert which I add to all my cards.